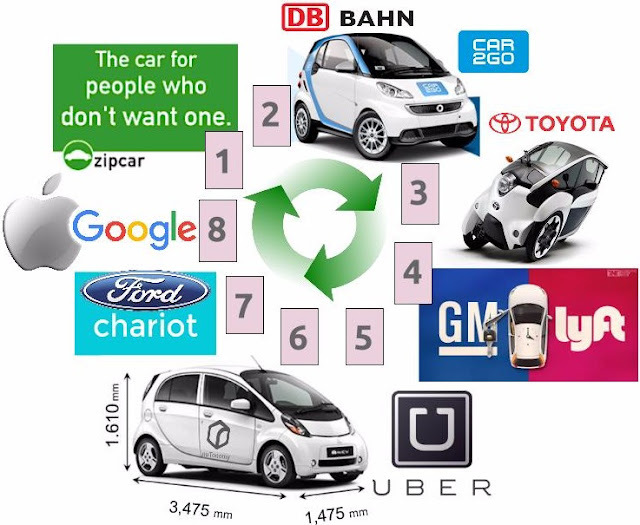 Will the car come full circle... turn in an Auto-Mobile? 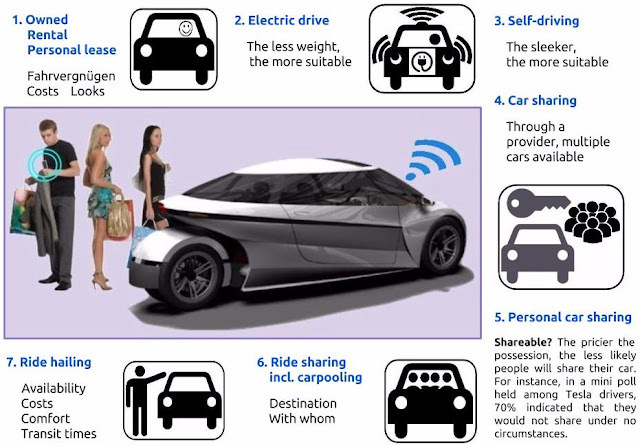 Car sharing, ride-haling, carpooling on demand, self-driving taxi's, frustrated automakers, shuttle services, railway companies eyeing the possibility of door-to-door service, "skip ad to continue driving"... Time to put some developments into perspective, and extrapolate. 1. ZipCar is one of the oldest car-sharing companies in the world. Objective was to do something about the waste of resources that comes with people each owning a car that is maybe used 1-5% of the time. By 2013, average vehicle occupancy had decreased to 1.5 persons per vehicle. In 2014, the U.S. had 260 million registered vehicles and 214 million licensed drivers. ZipCar offers a choice of cars from different brands. Obviously, what’s incorporated and branded on a global scale, i.e. making cars available to whoever wants to use them, can of course also be organized on a more local scale. 2. Car2Go is Daimler’s attempt to retrieve a fraction from the multi-billion dollar losses that were made in its Smart division, by making the ForTwo available through car-sharing. Car2Go is available in hundreds of cities around the world. Deutsche Bahn DB started using the ForTwo as part of its door-to-door service. DB is even considering branching out into autonomous cars, and compete with TNCs. PSA seems to want to follow a similar route as Daimler took. It will launch car-sharing services in Los Angeles in partnership with Bollore Group, CEO Carlos Tavares said that as the French maker of Peugeot, Citroen and DS cars, PSA steps up its diversification strategy. “We’re working with a good number of cities, including LA, to offer car-sharing solutions with Bollore Group” Tavares said, adding that the company had “other discussions in progress”. 3. One of the most exciting new developments, is the tilting 1+1 three-wheeler, called i-Road, especially since it comes from the world’s #1 car maker. Meant for urban use only, maximum speed is limited to 30 mph. Because of its extraordinary small footprint, it can be parked nearby. Toyota is experimenting with the i-Road in a shared capacity in selected cities. If successful, it will undoubtedly have an effect on car use and… car sales. 4. * One of the most conservative car makers in the world took a $500 million stake in Lyft, which is a ride-haling company, often referred too as a TNC (Transportation Networking Company). General Motors sees its business model of making and selling cars nibbled at, and hopes to cash in on the whole sharing thing. Lyft reportedly did turn down GM’s $6 billion offer to buy the company. TNCs enable car owners to provide ride services, as ‘independent’ contractors, for a certain fee. An app lets the customer know all relevant info for ordering a ride. 5. Uber and other TNCs brought increased competition to the taxi branch. Result has been a decline in the value of taxi licenses that have restricted the number of taxis in a given locale. Uber, by far the best-funded, epitomizes the whole sharing trend that disrupts. As such it is the target of ongoing protests and legal action from taxi drivers, taxi companies and governments around the world. Both Lyft and Uber are facing lawsuits from drivers who want to be treated as employees, not independent contractors, to be able to obtain benefits. Reason why Uber invests in self-driving technology. No drivers needed then. Will Uber be able to 'close the loop', or will another 'player'? 6. NuTonomy just started inner city ride-services in Singapore with the world’s first actually functioning self-driving car, the Mitsubishi MiEV. You might say that it managed to beat Google and Uber to the punch. This former MIT spinout has been working with Singapore authorities for quite some time now. The trial is a lot similar to what Uber is doing in Pittsburgh; customers will use NuTonomy’s ride-hailing app to book a ride, and like Uber, an engineer will be in the car to monitor the system and take over control if needed. With 24/7 door-to-door ride services, everything taken care of, no doubt Google had (local) public transportation in its long-term sights as well. Its robo pods were supposed to come devoid of any superior driving experience and designer feel. That would set Google apart from Apple with its core focus on the way its products look and make you feel. However, frustrated by the slow progress autonomous driving technology is showing and by American authorities that insist on Google cars having a steering wheel, Google now plans to expand its new ride-sharing service focused on carpooling, by using its Waze app with which it had been experimenting in and around San Francisco. Apple's car project Titan has reportedly been halted; Apple did a vain attempt to work with car companies, them in a Tier 1 role. It now concentrates on connectivity instead. Below all considerations tied in to car usage. Can a car be a personal joy to use and tool-like to share? TNCs that mainly focus on a superior A-to-B ride experience for the paying customer, can differentiate towards what’s considered CT domain. Community Transport, efficient when moving lots of people during rush and office hours, is cumbersome, costly and eco-unfriendly when when demand is less. A sleek, lightweight vehicle is able to provide the sort of around the clock door-to-door transport, that CT will never be able to. Response and transit times can be reduced compared to that of a big limo too. What started out with an APP, may come full circle when a new APPliance-like transportation mode is inserted into the process of moving people. * Update Oct. 4th: Lyft’s director of transportation, Emily Caster, said, “Drivers on the Lyft platform will be receiving Bolts to drive first.” The Chevrolet Bolt is GM's electric car.